Scenic drives are one of the best and most versatile ways to view the abundance a place like Western Montana offers. There’s no better time to catch our best colors than mid-September and early October. You can cruise our open highways, feel your jaw drop on our scenic byways, discover what’s hidden around backroad bends and explore our small towns along the way. It’s hard to compete with a scenic drive…unless you take a scenic drive in the fall, of course. The added color is icing on the cake. That said, we’ve rounded up a few of the top places to take a fall drive in Montana. Sitting at 96 miles long and cradled by the Sapphire Mountains on the east and the jagged peaks of the Bitterroot Mountains on the west, Montana's Bitterroot Valley is a prime destination for viewing fall foliage. In addition to forested terrain and plenty of outdoor activities, the valley is also home to the storybook communities of Darby, Hamilton, Victor and Stevensville. On the must-see list: the historic Daly Mansion and its 46 lush, tree-covered acres. Round out your visit with a stop at the Lee Metcalf National Wildlife Refuge or a stroll along the Bitterroot River. Along Highway 200, the Clark Fork Valley is home to several small and charming towns, like Paradise, Thompson Falls and Trout Creek. Each has their own personality and offerings, like fishing on the Clark Fork River and soaking in a natural hot spring. Additional highlights include the nearby National Bison Range, the Thompson Falls fish ladder and several fire tower lookouts. 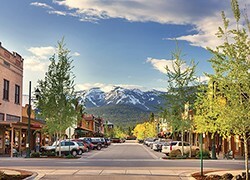 Home to charming communities like Columbia Falls, Whitefish, Kalispell, Bigfork and Lakeside, Montana's Flathead Valley is prime for fall foliage viewing. Roll the windows down and cruise along Highway 35 as it winds along the east side of Flathead Lake—the largest natural freshwater lake west of the Mississippi. Or paddle a kayak on Whitefish Lake for beautiful views of Big Mountain and the surrounding forest. For a colorful hike and views of the Swan Mountains, plan to spend time in Jewel Basin. For an up-close look at autumn foliage in the Crown of the Continent, plan to bring your bike (or rent one from a local bike shop) and cruise Glacier National Park's Going-to-the-Sun Road. Off-the-beaten-path adventures include driving the Looking Glass Highway (Highway 49) for a beautiful view into the Two Medicine Valley, exploring Many Glacier and traveling into the North Fork of the park, with a stop at the Polebridge Mercantile. While lodging inside Glacier National Park closes in mid to late September, the park's surrounding communities of West Glacier, Essex, East Glacier Park and Hungry Horse offer plenty of lodging options. For an off-the-beaten-path adventure brimming with fall foliage viewing opportunities, set your sights on the far northwest corner of the state—Kootenai Country. Home to the Ross Creek Cedar Grove, Libby Dam and Kootenai Falls, this corner of Montana is one of the most undiscovered, but stunning, areas in the state. Travel on Highway 2 from Kalispell to Libby as the road meanders through forested terrain. Once in Libby, envelop yourself in fall foliage with a trek into the Cabinet Mountains Wilderness. And for beautiful views of Lake Koocanusa, travel the winding scenic byway between Troy and Eureka. Missoula—Montana's cultural hub and second-largest community—is a Glacier Country fall hotspot. The valley offers easy access to the Rattlesnake Wilderness and Blue Mountain Recreation Area for plenty of fall hiking and biking. This aptly nicknamed Garden City is known for its impressive fall transformation. For a stunning view of the colors in the city, make the trek up to the “M” on the face of Mount Sentinel. A 90-mile-long corridor stretching from Seeley Lake to Swan Lake on Highway 83, this scenic drive winds through one of the region's loveliest valleys. With the Swan Mountains on the east and the Mission Mountains on the west, the Seeley-Swan Valley is known for hundreds of lakes, beautiful hikes and water recreation. It's also home to numerous tamarack trees whose needles turn beautiful shades of gold in the autumn. While you're here, be sure to see Gus—one of the largest tamarack trees in the nation.